Now is the time in the Memphis high school year where juniors and seniors celebrate the last big dance of the year: prom. This is a time to make great memories by getting dressed up and celebrating. Part of the prom celebration involves flowers, including a prom corsage and prom boutonniere. 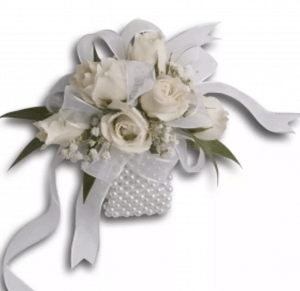 The Corsage and Bout Package is a great time and money saver. There are many color combinations, such as the red and white combo with gold trim, to choose from. Purple is a popular color this year, and this corsage showcases it. There is a pearl wrist bracelet, three white spray roses, and lots of purple ribbon on this glamorous prom corsage. 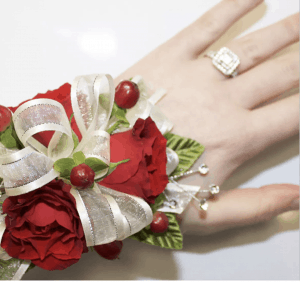 Simple and elegant, this prom flower package includes a corsage with white ribbon and flowers on a rhinestone bracelet. The boutonniere matches. This new trend for prom includes a metal cuff that’s approximately one-inch wide and can be adjusted to fit most wrist sizes. There are many colors and flower varieties available to match your style and budget. 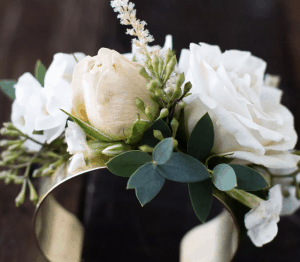 This corsage for prom features a variety of flowers that are combined with greenery, wire accents, and ribbon. It comes on an elastic band to wear around the wrist and is available in three color schemes. Tiny white roses are arranged on a beaded pearl bracelet to create an elegant prom corsage. 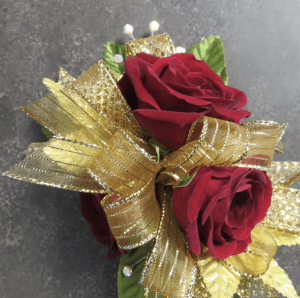 If gold is your color of choice, then you will love this prom wrist corsage. Choose from red, white, or pink roses to match your dress. This dramatic red corsage goes with all dress colors and styles, setting off your prom attire with an extra glamorous touch!